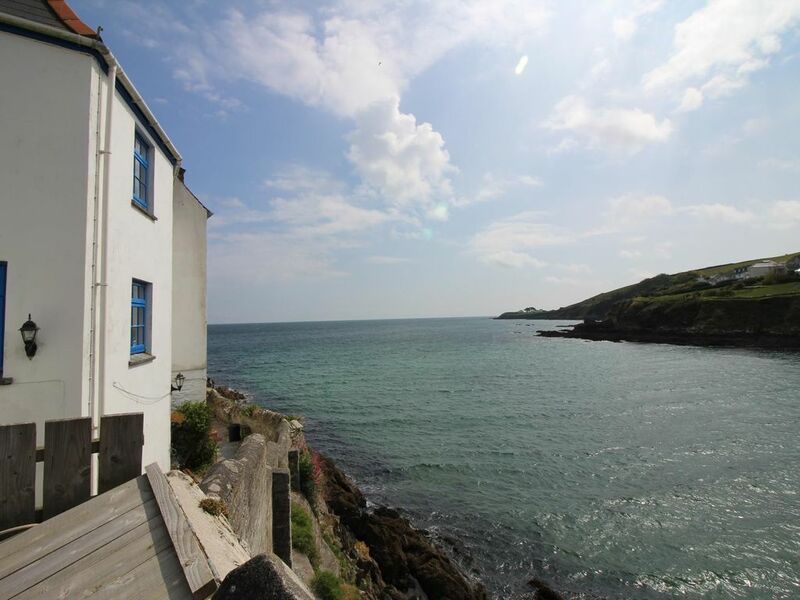 Chy Rani is a traditional fishing cottage perched high on the rocks above Portmellon beach, with a kitchen dining area downstairs and an open plan living area, bedroom and en-suite accessed via a spiral staircase on the floor above with stunning views of the beach, sea and cove. The owners take great pride in supplying their guests with a perfect, convivial environment, from arrival treats for any guest dogs, home baked welcome cakes and even packing a beach bag just in case you have left something behind! One thing is certain this will be a memorable holiday destination for all the right reasons! Portmellon is a quiet little cove surrounding a sandy beach, there is a pub on the other side of the road which serves local ales and home cooked food. Portmellon is less than a mile from the pretty harbour of Mevagissey which was once the centre of the Pilchard industry on the South Coast and most of the quaint cottages around the harbour were originally built during these times, Mevagissey is well endowed with a great variety of further pubs, shops and restaurants. Further west is the pretty village of Gorran Haven and Caerhays Castle and on, to the magnificent Roseland Peninsula. First Floor: Open plan living area and bedroom, with comfortable chairs and footstools, flat-screen Freeview TV, double bed and en-suite with shower WC and hand basin. Please note there is only a curtain to the en-suite due to the size and shape of the room. Exterior: South facing sun terrace with chairs and table and magnificent sea views. There is access to the other cottages along the row so this area is not completely private. Heating is via electric night storage heaters. The kitchen has a range of equipment. There is an electric oven and hob, a dishwasher, microwave, toaster, kettle and fridge / freezer, washing machine and heated drying rack. The sitting room area has a flatscreen Freeview TV & DVD player. There is an iron & ironing board. Free WiFi is available at the property. Electricity, heating, bed linen, towels and beach towels are all included. One dog is welcome at the small additional charge of &pound;30 per week, but please note your dog may not be left unattended in the property at any time. Although dogs are accepted at Chy Rani they are not allowed on the beach during July, August or September. No smoking is allowed at the property. There is no parking at the property but you can park in the Rising Sun Car park opposite for a small fee or there is on street parking nearby. Arrival / Departure is a Saturday only. Chy Rani is a lovely little couples retreat, perched on the rocks above Portmellon Cove and beach, the glorious views, tranquil sounds of waves lapping and the Cornish sea air will whisk you away from the daily grind and reinvigorate the soul. Location excellent. Parking available close by, price upfront would have been helpful. Accommodation was good. An enjoyable stay. We really enjoyed our stay in Portmellon with fantastic views and peace and quiet. The cottage is well equipped and laid out . Centrally situated for many towns in Cornwall for example we took the ferries From Mevagissey to Fowey and then St Mawes to Falmouth. Mevagissey is a short walk away and is well worth visiting with plentiful pubs and restaurants and the working harbor. After all that sightseeing you must need another holiday! So pleased you enjoyed your stay and many thanks for your very kind comments. Outside patio could have been more presentable. Otherwise the cottage is id al for two people and the interior is very well presented. The owner is most attentive and is a fount of knowledge about the locality. Many thanks for your review. We feel very lucky to live in An Area Of Outstanding Beauty and are delighted when our guests share our enjoyment of the views, walks places like Heligan and Mevagissey. Lovely cottage in 5 star location. Thanks Stuart for added extras. Fantastic little cottage in a perfect location. Mevagissey just a 10 minute walk over the cliff and we did a lovely coastal walk from Portmellon past Chapel point to Goran haven. Lovely to sit outside our cottage in the morning with a cup of tea as the sun came up and the sea came in. Thank you so much for taking the time to write such a kind review about Chy Rani. We love Portmellon and have tried to make the cottage as welcoming and well equipped as we can for our guests. Portmellon is ideally suited to visit the world famous Eden Project, The Lost Gardens Of Heligan and the famous port of Charlestown. It is placed on the Coastal Footpath which runs past the cottage and offers a wealth of destinations both along the coast and inland. Portmellon has a variety of beaches nearby, from the family friendly Gorran Haven to the isolated Vault Beach near Dodman Point. Water sports and cycle hire are on offer at Pentewan. Meander along narrow lanes past tiny beaches through the beautiful Roseland to St. Mawes. From here take the passenger ferry to Falmouth sailing through the third deepest harbour in the world to visit quayside pubs and restaurants and see The Maritime Museum. From Chy Rani you are only a drive away from King Arthur's seat at Tintagel, or Doc Martin's seat at Port Isaac, or an artist's seat at The Tate in St Ives. But, perhaps the nicest part of our location is that without moving you can just sit within touching distance of the sea, and enjoy the view! Electricity, heating bed linen and towels and beach towels are all included.